Max originally wanted to call this "General Grant and Private Twain," because much of it concerns the post-Civil War friendship between those two Scotch-drinking, cigar-smoking, prose-writing giants. The novel begins with Grant's decision in 1880 to seek a third term as Presidenthe will fail, not for the first time in his lifeand ends with his heroic struggle to write his Memoirs as he lies dying of throat cancer. Twain will publish them. The leading twerp of the 19th century, historian and novelist Henry Adams, also makes a malign appearance, along with his wonderful wife Clover. "Serious, intricate... gripping... Byrd is an expert a linking the products of his own imagination with historical facts." "Historical fiction doesn't get any better than this." "With the license and gifts of a first-rate novelist, Max Byrd has managed in Grant to reveal the man far better than those who have tried before." "A vibrant, stunning story of Grant's last years, but best of all, a gripping tale of 'the reborn nation on the other side of the war.'" "Splendid . . . nothing less than a visit with greatness." In 1784, Jefferson, the newly appointed American ambassador to the court of Louis XVI and Marie Antoinette, arrives in Paris—a city adrift in intrigue, upheaval, and temptation that will challenge his principles, incite his passions, and change him forever. Through the eyes of his impressionable young secretary, William Short, readers watch as the future president builds his dream of America with fellow patriots John Adams and Ben Franklin, while struggling between political ambition and an unexpected crisis of the heart with a woman who has the power to destroy him. Behind the face this complex Virginian shows the world, Thomas Jefferson is an enigmatic statesman who fights for individual liberty even as he keeps slaves, who champions free will even as he denies it to his daughters, and who holds men to the highest standards of honor—even as he embarks on a shadowy double life of his own. Cameo appearances by the irresistible bon-vivant Gouverneur Morris and Jefferson's personal slave, James Hemings. "A wonderfully vivid novel that brings the Sage of Monticello to life. 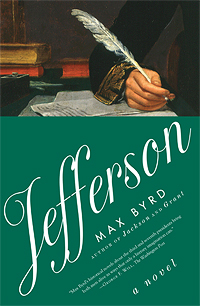 Jefferson has the organic intimacy of a novel that has sprung full-blown from the imagination of its creator." "Max Byrd's historical novels about the third and seventh presidents bring both men alive in ways that only a literary imagination can." "Superb . . . fascinating in the psychological insight it provides to one of the greatest Americans . . . a truly memorable book." "Absolutely splendid historical fiction that resonates with international, provincial, and individual passion and drama." "A real tour de force." He became a legend during the War of 1812. He was a slave owner, land speculator, and Indian fighter. He stole another man's wife, murdered men in duels, and ordered military executions. But Andrew Jackson was also an impassioned supporter of universal suffrage and an ardent believer in the will of the people. Here the story of our controversial seventh President is told from a variety of viewpoints, including that of a young writer named David Chase who discovers, on the eve of the presidential election, a secret that could change the future of the nation. Along the way, readers encounter such notable figures as John Quincy Adams, Aaron Burr, and Sam Houston, and bear witness to an America in transition—and a man as unpredictable as democracy itself. 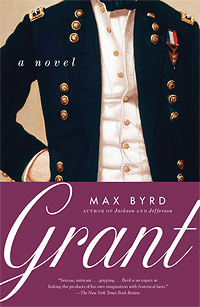 "With Jackson, Byrd has vaulted into the front rank of American historical novelists." "Vivid and compelling . . . a convincing and intriguing portrait of Jackson as he might have been." 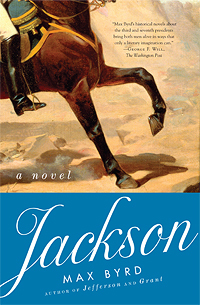 "Full of action, emotion, and insight, Max Byrd's Jackson deserves to stand with the finest works of historical fiction." "Grounded in excellent, detailed historical research, Byrd paints a rich, multilayered portrait."